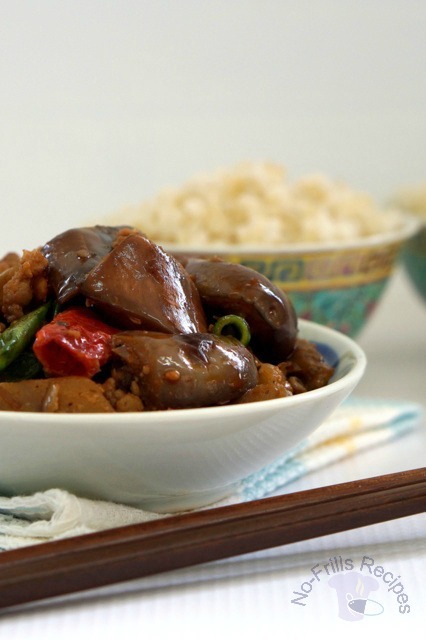 There are many ways to prepare eggplant and to me, the most fuss free method is to just cut it up, steam and then serve with some garlic oil and a dash of pepper. But today, I want to share with you a more 'complicated' method whereby I pan seared them, mixed in some Korean bean paste, bits of pork and added in some dried chillies to make the dish slightly spicy. 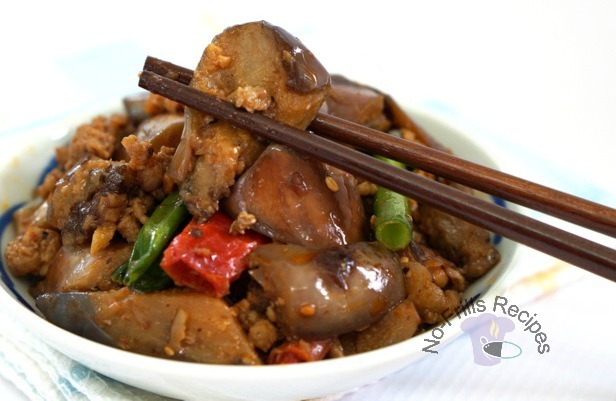 This dish pairs well with rice or plain white porridge. 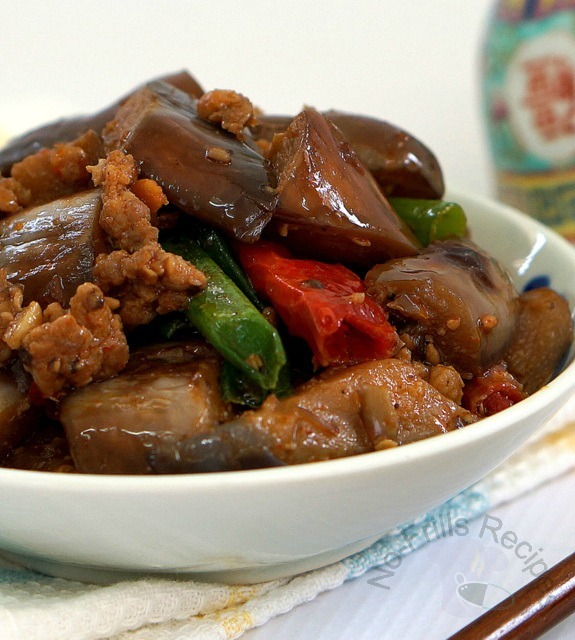 Heat up some oil in a wok, sear the eggplants till brown on all sides. 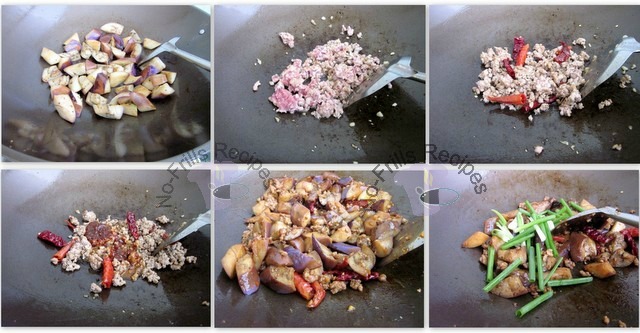 With the remaining oil in the wok, add in the garlic, minced pork, dried chillies, stir-fry. Mix in the sauce, stir-fry. 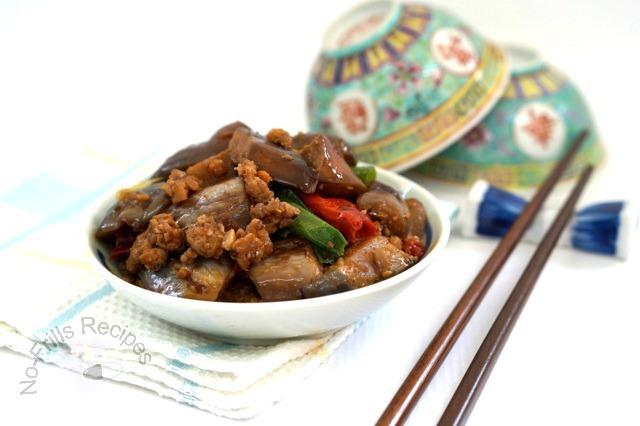 Toss in the eggplants, spring onions, mix well. Fine tune to taste. Drizzle on the wine, dish out and serve hot with rice. Ha, ha, you're most welcome, Sharon! Give this a try, Ann! I like eggplant. It doesn't matter how it is cooked, I enjoy them all. Looks like many of us enjoy eggplant! It's nice to pair it with a bowl of hot plain porridge! 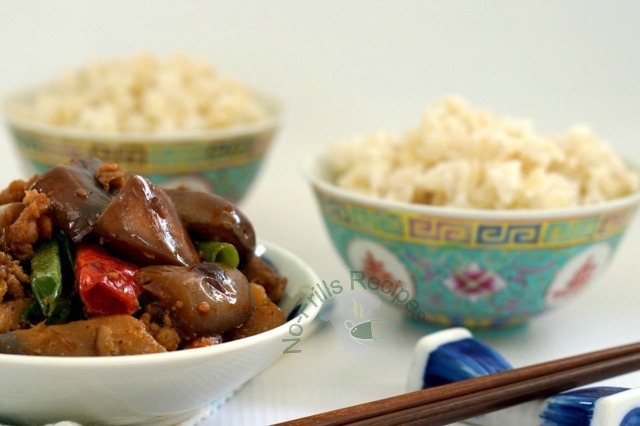 We love brinjal dishes! This one looks superbly delicious! Will try it. Yes, do give this a try and you enjoy your weekend too, Jacqueline! Thank you, I was very pleased with the first picture! Your way of cooking it, sound so flavorful! I can eat the whole plate by myself .haha!